Update, July 31, 2013: If you found this article after reading the story in the USA Today, read our response here. It is possible that the information below regarding amphetamines is wrong. Read the rest of this with extreme caution — and consider reading the link above instead. 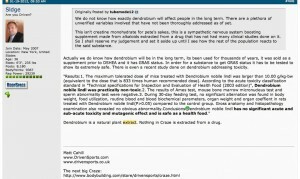 We have some great news – a lawsuit filed in March of 2012 against Driven Sports has been dismissed, putting a final nail in the coffin regarding whether or not there are (or ever were) amphetamines in their epic pre workout supplement, CRAZE. DS’s full press release can be found here. Check out our video recap of the situation, and see the details under it. Driven Sports releases the Craze pre workout supplement in November of 2011. Initial users immediately know that this is likely a “next big thing” since it works so well in the focus and energy department. Some users go so far to state that they believe the product is adulterated with banned substances because of the euphoric feeling they get from it. It’s important to note that the main ingredients, Dendrobex (from Dendrobium flower) and Citramine have not been used anywhere else in the nutritional supplement industry, so it is definitely a “new” feeling. 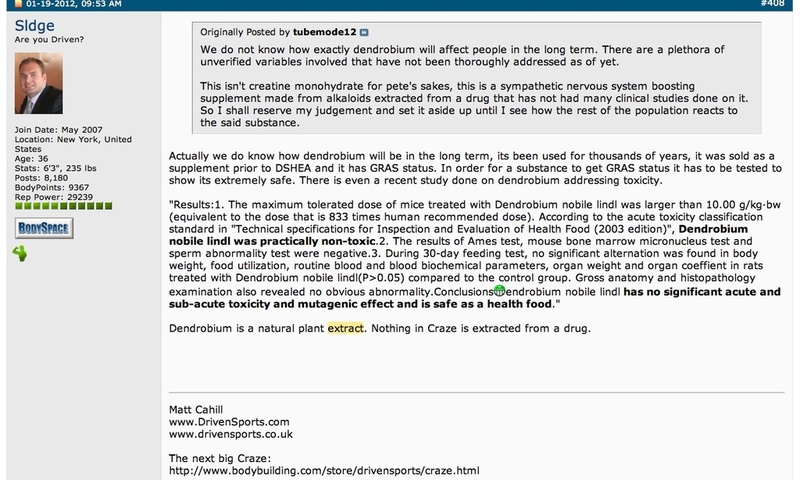 Upon being questioned about dendrobium, Matt Cahill, the CEO/Founder of Driven Sports, went on to state that “Dendrobium is a natural plant extract. Nothing in Craze is extracted from a drug. (see screenshot up to the right). This, of course, means that the floodgates for attack are going to eventually open. 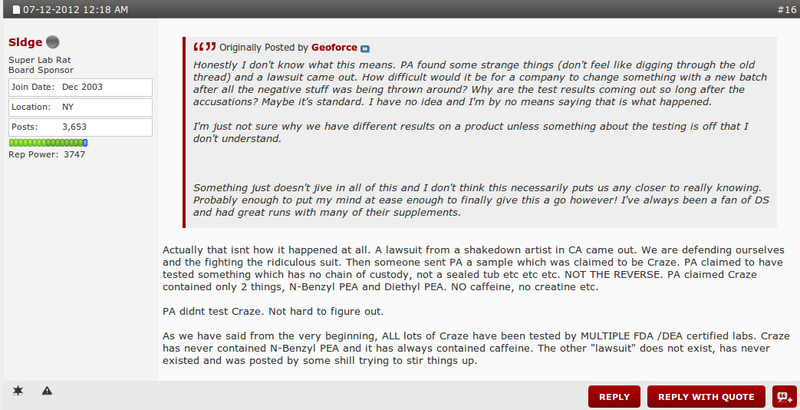 So in March of 2012, a user named heavyd12 came to the Bodybuilding.com and AnabolicMinds.com forums and claimed to be close to the plaintiff. He went on to state that he was an employee of another supplement company (which we believe to be Life Extension), and dropped some hints that Driven Sports would soon be sued due to having amphetamines in Craze. This person went on to claim that Driven Sports was clearly guilty under the Federal Analog Act*, and that he felt the industry needed proper watchdogs to keep things clean and free from doping. His lack of proof in this matter got him banned from all forums, and most threads were deleted. *In short, this is part of the US controlled substances act that deals with drugs being “similar” to illicit drugs — in this case, amphetamines. 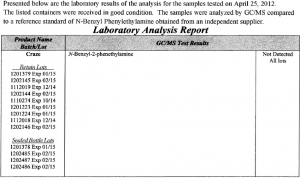 Basically, the forthcoming lawsuit would [wrongfully] stating that Craze’s main ingredients, Dendrobex (from dendrobium extract) and Citramine were extremely similar to amphetamines, to the point of being illegal. He also stated that they were synthetic and not ever naturally derived, which would have violated a few other laws. Wikipedia has plenty on the Anaolg Act here. Shortly thereafter, a lawsuit was unearthed (our mirrored copy is here), which shows that a man named Aaron Karmann with the Newport Trial Group was suing Driven Sports. As mentioned above, the Federal Analog Act and the two main ingredients in Craze were cited in the lawsuit. It was quickly determined that Karmann was nothing but a “shakedown artist” — someone who exploits a company’s potential weakness for personal gains – in this case, likely hoping for an out-of-court settlement. Knee-jerk reactions were made all over the web, including YouTube, because, after all, Craze did seem to have something “extra” going on in there. Many uninformed videos discussed it potentially having amphetamines, which both created and lost business for Driven Sports. Driven Sports was then attacked on another front by Patrick Arnold, who claimed to have found N-Benzyl PEA in CRAZE, yet it wasn’t on the label. This makes no sense, because N-Benzyl PEA is basically useless in a product like this. Also note that Patrick Arnold owns competing companies… something to chew on. As you can now imagine, DS is quite upset, and sent a “cease and decist” type of letter to Arnold, claiming libel from a competing company. They also stated that he had no “chain of custody” that proved he was testing any product that was 100% untouched and sealed from Driven Sports manufacturing to the final testing facility. This is hugely important in testing for substances. See the image to the right for Cahill’s response. It basically explains everything going on, neatly wrapped up in one post. Note that this is where we got the phrase “shakedown artist”. Cahill of Driven Sports then did something that I think was the right call – FULL disclosure on all of their batch testing. 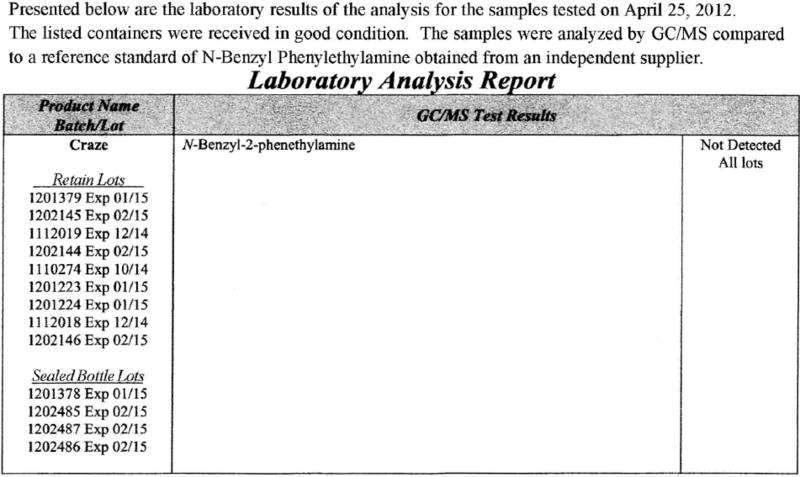 Not a single trace of amphetamine, amphetamine-like analogs, or N-Benzyl PEA. See the shots below. Things then went quiet from our end. Driven Sports had some issues with Lean Xtreme and had to pull that from the shelves and reformulate it… and we assume they spent this time running their business while their lawyers fought The Newport Trial Group. Who knows. And finally, last week, DS put out their press release stating that the case was dismissed. Thank God this mess is over. Now here’s my two cents to the whole issue. This entire thing turned out incredibly well. I’m sure Driven Sports didn’t enjoy the legal fees, but it proves that the industry is extremely self-policing. 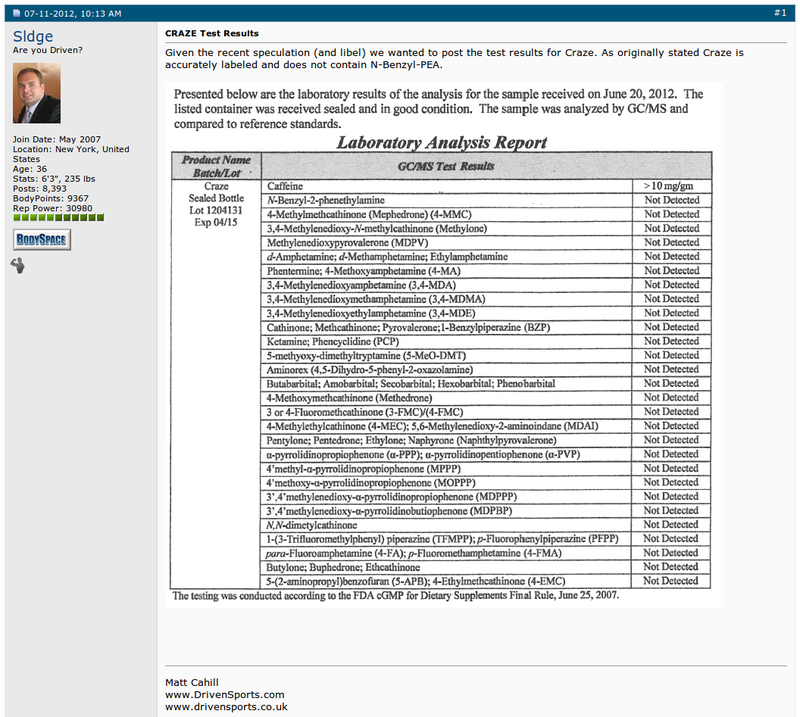 When needed, the proper tools are in place (certified labs and legal counsel) for a quality outcome like the one we see here. As you know, nutritional supplements are very unregulated in the US, and for the most part, it works out very well in this regard. 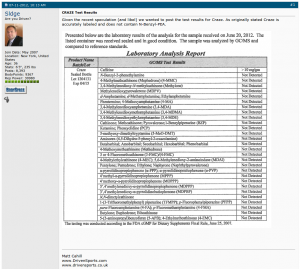 Nearly all users know that they are responsible for reading the warnings on labels, and those who are drug-tested athletes know to stick with cGMP compliant supplements just in case, and products from companies that use accredited labs. They’re simply safer than prescription drugs (which are approved by the FDA) kill hundreds of thousands of people. Supplements do not. At the end of the day… we don’t need no stinkin regulation. We have just enough, and with the helpful community bloggers, forum posters, and certified labs who investigated the idiocy that went down in this thread, we have everything we need to stay safe. Those of us who care know to use new products from new companites at our own risk, and to stick with the trusted ethical few. 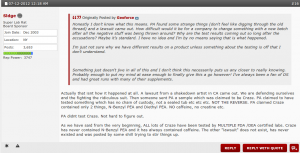 No Comments | Posted in Supplement News | Tagged Craze, Driven Sports, Lawsuit.